Hi friends! Hope you are doing well today! Half way through the work week! I can't wait for the long weekend, can you? :) Well, assuming you get a long weekend. Honestly, hubby only has a regular weekend since his schedule is wonky this week but we'll make the best of it. My mom is coming to hang out with the kids so that will be nice for everyone. 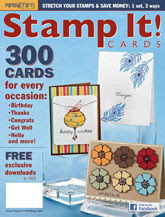 Yesterday, Stamp It 8 came out. You can buy it HERE. This is a really cool issue! It's all cards, as the cover shows. It's just jam packed with awesome ideas and gorgeous projects from a bunch of awesome designers. I'm lucky enough to have two projects in this special issue. Here is one of the cards that I have in this issue. For details on the products and instructions on how to make this, please see page 36. Congrats girl, going to have check this out! 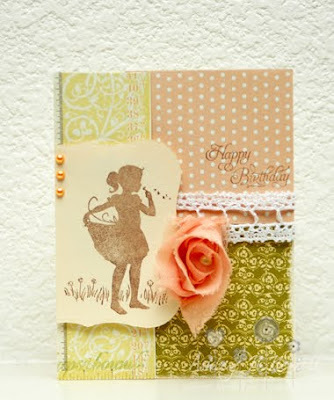 What a gorgeous card and congrats to you!!! !